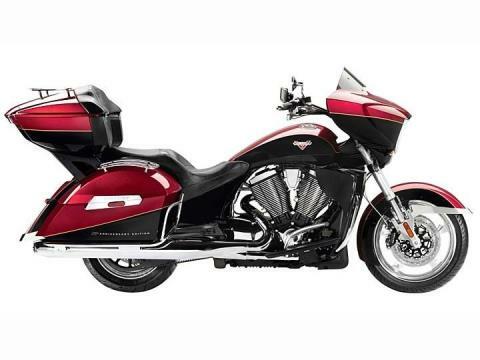 Victory Motorcycles celebrates its 15th Anniversary with the 15th Anniversary Cross Country Tour® Limited Edition. It’s the touring motorcycle with special custom features, premium GPS and audio, and paint that pays tribute to the first bike built by Victory Motorcycles. The bike’s beautiful paint is complemented by extensive chrome. Among the many components finished in premium chrome are the: Front and Rear Fender Trim, Sprocket Cover and Engine Covers, Fuel Cap, and the Switch Cubes with the audio and Cruise Control buttons. Only 150 bikes will be made featuring this exclusive Antares Red over Gloss Black Paint with Gold Pinstriping. This handsome paint scheme replicates the paint of the first Victory motorcycle ever built on the Fourth of July 1998. The bike’s 41 gallons of protected cargo space – the most storage of any motorcycle in the world – is complemented by the Chrome Trunk Luggage Rack. There are also removable Saddlebag Liners and a removable Trunk Liner so it’s easy to transport luggage to and from the bike. A 15th Anniversary Cross Country Tour Limited Edition rider will roll in style on Billet Wheels. These custom-look wheels have a stylish, sporty look and they complement the bike’s extensive chrome. Riders enjoy comfort and style with the Custom Cut & Stitched Seats. The seat material features the look of carbon fiber, and the latest Victory milestone is celebrated with the 15th Anniversary Stitched Passenger Backrest. The seats have separate driver/passenger heat controls so riders can extend their riding seasons in comfort. Even the savviest touring rider can use directions now and then, and this bike is equipped with a Garmin GPS. This unit will provide accurate maps, directions and lists of services such as fuel stops, restaurants, lodging – and the complete Victory dealer network. Each 15th Anniversary Cross Country Tour Limited Edition will feature a 15th Anniversary Numbered Dash Badge that confirms the rare and special nature of these outstanding bikes. Only 150 of these bikes will be built. The 15th Anniversary Fairing Badge proudly brands the 15th Anniversary Cross Country Tour Limited Edition as an extraordinary motorcycle. The badge stands out vividly on the fairing’s Antares Red paint. The ultimate touring bike is equipped with the ultimate in audio. The fairing’s integrated audio system has AM/FM and XM Radio. Plus, an iPhone / iPod Cord makes it easy to connect a rider’s device to enjoy personal playlists. And all the sound is pumped through KICKER Premium speakers. The bike’s saddlebags become stylish focal points as they feature the Antares Red over Gloss Black Paint with Gold Pinstriping and 15th Anniversary Saddlebag Decals. Plus, the Chrome Saddlebag Rails complement the bike’s extensive chrome and provide low-speed tip-over protection.